This chapter presents and explains Engineering Options Analysis (EOA) in two ways. First, we present it for what it is: an approach to quantitative analysis for planning, design, and management of engineering systems over time, in the context of uncertainty. We offer a brief introduction to the approach, and then go through each of the broad methodological steps. Second, we underline important differences between EOA and Real Options Analysis (ROA), and contrast EOA briefly with other methods presented in this book. While the chapter synthesizing the DMDU approaches covers this topic in a general way (Chap. 15), it is useful for clarity to cover it briefly here. Since EOA and ROA sound so similar, readers might easily assume they are really very close if not identical—but they are not! In a nutshell, ROA assumes that we can estimate future uncertainties sufficiently accurately, is generally limited to analyzing a single option at a time, and aims to develop single monetary values for options. EOA deals with deeper uncertainties, handles multiple options simultaneously, and allows for all sorts of measures of benefits and values. Engineering Options Analysis (EOA) refers to the process of assessing the value of including flexibility in the design and management of technical systems. It consists of procedures for calculating the value of options (e.g., the benefits due to flexibility in the timing, size, and location of changes in the engineering system) in terms of the distribution of additional benefits due to the options. EOA presents these benefits to decisionmakers in terms of average expectations, extreme possibilities, and initial capital expenses (Capex). Decisionmakers can choose whether (or to what extent) to monetize these values. Chess provides a useful analogy to EOA. How a game of chess will develop is deeply uncertain. So, how do chess masters deal with this situation? In general, they explore the possible combinations, and choose opening and subsequent moves to give themselves the position, as the game develops in time and space, to respond effectively as opportunities and threats arise. They do not have a fixed strategy; they develop a flexible strategy that maximizes their chances of success. Moreover, the immediate product of the analysis is the recommended first or immediate decision. So it is with EOA. EOA explores the context widely, compares the range of possibilities, and proposes strategies, and thus opening decisions, that are most likely to be successful in the long run. EOA is genealogically related to Real Options Analysis (ROA). It is fair to say that it is an offshoot of the corpus of ROA as Luenberger and Trigeorgis codified then existing practice in their texts (Luenberger, 1996; Trigeorgis, 1996). In the intervening years, however, EOA has grown significantly apart from ROA. Many researchers and practitioners have evolved the practice of EOA through their explorations of its application to a wide range of situations, such as the deployment of satellites (de Weck et al. 2004), the development of oil fields (Lin et al. 2013), hospital design (Lee et al., 2008), the implementation of factories (Cardin et al., 2015), the design of military ships (Page, 2011), and the renewal of facilities (Esders et al., 2015). At present, the books by de Neufville and Scholtes (2011) and Geltner and de Neufville (2018) are the primary textbook presentations of the EOA approach. EOA is based on computer simulation of the interaction of the possible uncertainties, and of the thoughtful managerial responses to events as they unfold. The logic is that this is an efficient way forward, given the computational immensity of many problems, and the lack of acceptable simplifying assumptions (such as path independence) that might enable a feasible way to compute a best solution explicitly. The idea is to examine the consequences of a sequence of scenarios that combine both possible circumstantial outcomes (how fast might sea level rise, for example) and the reasonable managerial responses (when to install new pumping stations). For each combination of uncertain events and subsequent management decision, EOA calculates the associated consequences. By examining the range of possibilities, we obtain the range of outcomes. Furthermore, by sampling the range of uncertain possibilities according to their estimated distributions (in cases of deep uncertainty we do not have to fixate on a single one), we develop distributions of the possible outcomes. In short, the analysis imposes distributions on the system, and obtains distributions of outcomes from the system—as modulated by the complexity of what happens within the system. Finally, EOA efficiently organizes the immense data it inherently provides. In general, the analysis generates thousands of data points associated with a range of alternative strategies. EOA makes sense of this information through the way it structures the analysis itself, and the way it contrasts the results. To explain the use and value of EOA, this section takes three perspectives. First, it sets the scene: it sketches the kinds of issues that EOA can address effectively for the benefit of both decisionmakers and the larger public of stakeholders. Second, it describes the main steps of the analysis itself, emphasizing their roles, rationale, and usefulness in the procedure. Finally, it indicates the kinds of results we can expect from EOA: clear, compact representations of the results that support insights into good strategies for dealing with deep uncertainty. Understand the range of possible outcomes of any strategy for dealing with uncertainty. What is the worst that can happen? What is the best? Appreciate what may occur in terms of the likelihood of the possible amounts, the possible timing and location of these events, and distribution of beneficiaries. Have information, both about extreme possibilities and about benefits versus costs, about the “value for money” of alternatives. Obtain insights into their problem: which strategy provides the best outcomes and why? EOA explicitly supports all of these requirements. EOA recognizes that analysts of modern engineering systems face deep uncertainties. This goes with the territory of analyzing and designing the complex, often large-scale, interconnected technological developments of our era. The design, rollout, and management of these systems require us to project into futures that we can only imagine. Consider the design of new technologies such as smartphones, or of major infrastructure projects such as the tunnel under the English Channel. The outcomes of such ventures depend on all kinds of unknowns. The case of the double-decker Airbus provides a cogent example. This aircraft is a marvel of engineering, but as a system it has failed to meet its financial objectives, a victim of unanticipated changes in airline routes and travel patterns. The fact is that the design of engineering systems is full of uncertainties, even if the detailed engineering of artifacts can be precise. We need to deal with this reality of deep uncertainties, and EOA is one way to fulfill this need. Importantly, EOA deals explicitly with the great number of alternatives for exercising flexibility. It easily and routinely considers the many ways that managers could alter the capacity of an engineered system, both in terms of its physical size and its functionality. This ability to choose the size, the timing, and the location of a change in the system implies an exponentially combinatorial set of possibilities. The number is daunting. The simple problem of considering 4 possible sizes, over 3 periods, in 5 locations implies 64 to the power of 5 or over 10 million logical combinations. Yet EOA can address these issues in a reasonable amount of time. It achieves this by sampling the space sufficiently to obtain a useful distribution of the possible outcomes. Most significantly in the context of options analysis, EOA has a feature of immense practical importance: it enables users to consider the value of multiple options simultaneously. This is a realistic requirement for dealing with real-world issues: at any time, managers can decide what kind of adaptation they should adopt. As discussed more fully in the section contrasting engineering options and real options below (Sect. 6.4), such analyses are not possible in routine financially based options analysis. It is important at this stage to be clear about the definition of an “option” in the context of options analyses, be they engineering, real, or financial. In this context it has a well-established, precise meaning—more specialized than the general sense in which it is often used in everyday language. To maintain consistency with the vast literature on options analysis, our discussion needs to keep to this tight definition. Over some time frame (may be limited or not). This definition is much more specific than the popular meaning, which interprets the word “option” very generously to include “policies, strategies, plans, alternatives, courses of action” as done elsewhere in some of the publications on decisionmaking under deep uncertainty. Please keep this in mind as we discuss the details of EOA. Formulate the (engineering system) problem or opportunity. Specify the objectives and outcomes of interest. Develop a computationally efficient analytic model of the system. Generate a set of options. Specify the relevant uncertainties, and generate a sufficient number of future scenarios (typically in the thousands, for instance). Calculate system performance across the range of scenarios, using computer simulation to couple the variation in external forces and the management responses in terms of exercising their options along the way (i.e., engage in “Exploratory Modeling”). Reduce the resulting data for stakeholder consideration, using suitable target curves and multi-objective tables to illustrate trade-offs. Support the choice of a preferred starting decision and plan for its adoption, using the insights the analysis provides. Implement a monitoring system that tracks variables that may trigger future adjustment of the current decision. Choose short-term actions and long-term contingent actions—EOA steps 8 and 9. However, the EOA approach differs subtly, but importantly, from the view that the framing of the analysis should specify a priori possible strategies. From the perspective of EOA, it is premature to define strategies before the exploration of the range of combinations. Indeed, often the practice to identify alternative choices early lead to overly simplistic visions of the possibilities. For example, many regions have set out the “airport development issue” as whether “to build a new airport or not”, yes or no. Such a frame fails to consider more complex, yet potentially more desirable solutions, such as “acquire land for potential new facilities, but defer action until the future becomes more clear” (de Neufville, 2007; de Neufville and Odoni, 2013). Step 1: Formulate the (engineering system) problem or opportunity. This step names the problem at the level suitable for the principal stakeholders. For example, it might be: “How do we best expand the water supply for Singapore?” A related but different statement might be “How do we ensure that available supply in Singapore meets realized demand?”—this implies a different constellation of solutions including demand management, and different impacts. Step 2: Specify the objectives and outcomes. This process names and quantifies these factors. For the water supply case, we might focus not only on the quantity of water (cubic meters, say) but also its rate (cubic meters per hour), its quality (potable or other), and its reliability in face of drought. The outcomes would reflect other important issues, such as capital and the operating costs, the environmental impacts, and so on. Step 3: Develop a computationally efficient analytic model of the system. Some exploratory modeling may be necessary in this regard. It is not necessarily obvious how best to characterize and explore the system. EOA requires the development or availability of an analytic model that is both technically acceptable and computationally efficient. The model must of course represent the technical, environmental, and economic reality correctly. But very detailed or precise models are not required when we are dealing with deep uncertainty. When the input values are obviously imprecise, it is pointless to strive for great detail in the technical models. Moreover, such detail may impede the analysis. Most importantly, EOA needs computationally efficient models that can run a great many scenarios—routinely thousands—within the period available for analysis. Sometimes such models are readily available and analysts can run them quickly on the fast computers we now use. Other times, analysts will have to create surrogate, simpler models that mimic the essential features of the detailed models. Analysts will then use these surrogates as “screening models” (i.e., as test beds) to “screen out” unattractive strategies and to identify the most attractive strategies. In this case, the analysts need to check the results from the screening models by testing the resulting strategies on the full engineering models. Step 4: Generate options. For example, for the issue of providing Singapore with adequate water, one option might be to add a desalination plant, another might be to extend a reservoir. Being options, system managers could exercise them when, where, and if needed. The analyst should choose options that are most effective in dealing with the uncertainties that have the greatest effect on the system. [A cautionary note in this regard: the parameters that are most uncertain are often not those that have the greatest effect on the system. Some parameters have significant leverage, so that their small variations can have disproportionate consequences]. Step 5: Specify the relevant uncertainties and generate scenarios. In EOA, the characterization of uncertainties should focus on identifying broad trends and likely ranges. In other words, what factors shape the uncertainty? Is it a ”random walk,” as is appropriate for commodity prices in a fluid market? Is it cyclical behavior, as is common for real estate markets? Is it likely to be monotonic, as one would expect for sea level rise? Is the distribution normal, or skewed in some direction? We can also estimate likely ranges based on a combination of past experience and an understanding of limiting factors, such as the competitiveness of alternatives, or physical constraints. This approach differs from that of financial options and ROA, where the object is to define the price or value of an option (using the technical definition of this term as a “right but not an obligation”). For those analyses it is correspondingly important to work with a well-calibrated model of uncertainty, usually derived from extensive empirical observations. In EOA, however, we estimate distributions and ranges of possible outcomes, and do not require precise descriptions of uncertainties. Having characterized the uncertainties, we then use computer programs to generate scenarios automatically by combining random selections from the sample space. EOA thus commonly examines “all” scenarios, insofar as its thousands of scenarios sample the whole space. In conjunction with the alternative strategies managers might use to exercise the options defined in Step 4. Good practice in EOA explicitly addresses the needs of decisionmakers and stakeholders. Typically, the idea is to use the analysis to compare alternative engineering fixed plans and flexible design strategies. For example, analysts might compare the relative advantages of modular and massive approaches to development, or of centralized and decentralized strategies. The decisionmaking under deep uncertainty (DMDU) community often refers to this assessment of different possible courses of action across diverse future conditions as Exploratory Modeling (Bankes et al., 2013). Graphical summary numerical representations of the computed distributions, either as probability or cumulative distributions. Either of these can usefully portray the extent to which some alternatives are more efficient, or less risky, or both (Geltner and de Neufville, 2018). Tables of data showing such indices as the average performance, the values at risk (or gain), the robustness (as indicated by the standard deviation), the present value of the costs, the net present values of the alternatives (if appropriate), and other factors associated with the alternative strategies. In short, EOA is “fit for purpose”: it directly informs decisionmakers and stakeholders quantitatively about their strategic choices. Modular plants can also deal profitably with greater demand than expected, should it occur. Such insights do not typically depend on precise descriptions of the deep uncertainties. Indeed, analysts can vary the input probability distributions and identify the ranges over which one approach is preferable to another. The projections of the uncertainties do of course influence the strength of the effect, but often not the essential nature of the insights. The general conclusion then is that a modular strategy, flexible as to the location and timing of modules, can provide greater expected gains and lower risks than the default single large facility, all at substantial saving of initial capital expenditures (Capex). This is a win-win strategy at less cost—a great result! Step 9: Implement a monitoring plan that tracks variables that may trigger future adjustment. An EOA is not a one-shot deal. It is a process of monitoring developments and readjusting. EOA is very much like the game of chess in this respect. At any point in the game, chess masters explore the possible combinations, and choose their next and subsequent moves to give themselves the position, as the game develops in time and space, to respond effectively as opportunities and threats arise. They do not have a single plan; they develop a flexible approach that maximizes their chances of success. Moreover, the immediate product of the analysis is the recommended first or immediate decision. So it is with EOA. EOA explores the context widely, compares the range of possibilities, and proposes strategies, and thus opening decisions, that are most likely to be successful. Subsequently, as time goes by, as the future clarifies, we should take note, extend the EOA, and act as appropriate. This section provides a thumbnail illustration of the EOA process. A journal article provides details on this case (de Neufville et al., 2006). The case also features as the running example in the textbook on EOA (de Neufville and Scholtes, 2011). More extended cases illustrate EOA in the companion EOA chapter in this book (Chap. 11). Step 1: Formulate the Opportunity. The general opportunity is to design infrastructures to provide better, less risky financial returns over time. Standard engineering practice is to design such facilities based on fixed forecasts of future demands. The opportunity lies in improving performance by recognizing and dealing with the evident uncertainty and variability in demand. The specific opportunity in our example concerns a multi-story parking garage, modeled on an actual design in England. Step 2: Specify the Objectives. The prime objective in this case was to “Maximize Expected Net Present Value (ENPV),” that is, the net present value (NPV) as a probabilistic average over the possible scenarios of demand for parking spaces. The secondary objectives were to improve the probabilistic distribution of the possible outcomes; that is, to reduce the maximum downside, to increase the maximum upside, while reducing the initial capital expenditure. Step 3: Develop the Model. The basic model was an Excel® spreadsheet of revenues and expenses over time, as a function of the demand. It set up a standard discounted cash flow analysis. We enhanced the model with IF/THEN statements to enable the exercise of options when demand exceeded thresholds1 justifying expansion of the garage. Step 4: Specify the Options. The options were to add extra floors to the existing structure of the parking garage. To enable this possibility, the basic structure had to have the strength to carry additional loads. Simply put, fat columns and bigger footings made it possible to add one or more floors to the garage at any time. The garage system then had flexibility over capacity and time. Step 5: Specify the Relevant Uncertainties and Generate Scenarios. The analysis considered that the actual demand in any year was a normal distribution around the forecast, both at the initial level and over time. The Monte Carlo simulation generated thousands of scenarios (or cases) in seconds. As in the real world, some scenarios started and remained low, others started low and went high, others simply varied up and down, etc. Step 6: Calculate the Performance. The spreadsheet calculated the performance of the systems, accounting for both the variation in demand and, most significantly, for how intelligent management would exercise the options (that is, when they would add floors in response to high demands). Step 7: Reduce the Data for Stakeholder Consideration. The analysis reduced the data on the thousands of scenarios to present “target curves” of both the frequency and cumulative distributions of the results, and to provide comparisons or trade-offs among objectives in table form, as in Table 6.1. Step 8: Choose a Preferred Strategy. Given the results, it was obvious that the preferred solution was a flexible design that started with a smaller structure than would seem optimal in the conventional designs, but that included extra strength in columns and footings to enable the options to expand when conditions were right according to the stakeholders. The smaller starting structure reduced the possible losses. The option to expand increased the possible gains in case of high demand. Overall, the flexible solution increased ENPV (a win), and lowered Capex by building smaller (another win). The EOA produced a clear win-win solution. Step 9: Implement the Preferred Strategy and a Monitoring System for Future Action. In practice, management would monitor the demand for parking spaces, and expand when extra capacity appeared desirable. This section highlights the differences between ROA and EOA. These arise from the fact that the two approaches fulfill different roles in quite different situations. Let us first consider the different professional contexts of these methods, and then pass on to the more significant detailed differences. 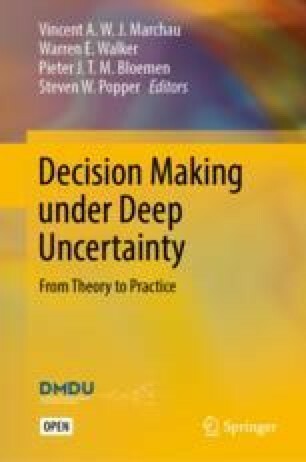 Most saliently in the context of this book, ROA and EOA deal with different kinds of uncertainty. ROA assumes that analysts can estimate uncertainties with reasonable accuracy from existing or available data. That is, ROA is suitable in a situation in which one knows, or acts as if one knows, the probability distributions (sometimes called the domain of Level 2 uncertainty—see Table 1.1 in Chap. 1). By contrast, EOA deals with futures that are largely unknowable, that concern conditions unparalleled in previous experience. EOA deals with deep uncertainly (Levels 3 or 4 uncertainty). ROA and EOA also differ dramatically in terms of their end objectives. ROA, as a sub-field of financial options analysis, seeks to determine the proper monetary value for a special kind of financial or similar opportunity known as an option or contingent claim. The objective of ROA is to find the correct price to pay for the purchase of an option. EOA by contrast seeks to determine the best design—the best strategy for implementation in a system. For EOA, the calculations are a means to determine which plans are best and, more generally, by how much. Whereas for ROA the calculation of the most appropriate expected price is the main object of the analysis, for EOA the calculation of this average is incidental—the objective of EOA is to help decisionmakers and stakeholders understand alternative plans, and to choose the one that best meets their needs. Best practice in engineering systems design recognizes that system planners typically need to balance average expectations with downside risks. Indeed, good engineering understands that a focus on average value can lead to bad policy recommendations and to inappropriate advice. A simple example of a contract for automobile insurance makes the point. (Formally, this contract is a “put” option on the potential loss; if the value of the car crashes, we sell it for the insured amount). When we think about it, we know that buying such an ordinary insurance contract does not maximize expected value. Insurance companies pay out less than they take in—they thus cover their expenses and earn some profit. However, even though buying insurance does not maximize one’s expected value, it does not therefore follow that you and I should not buy insurance. By buying insurance, we trade small periodic losses, and an overall expected loss, for some peace of mind and protection against disastrous consequences. We come to this conclusion because we consider the entire range of possible outcomes, as does EOA. Following on the above, we first remark that ROA is not “fit for purpose” for planners. ROA is focused on producing a market price for options. In general, this is not what decisionmakers or stakeholders concerned with deep uncertainty need. First, they need to develop an understanding of the range of possible outcomes of any strategy for dealing with future uncertainties. Second, their prime objectives may not be monetary; instead, they may be concerned with the risk of floods (climate change), morbidity and mortality rates (hospitals), reliability (water supply), or the likelihood of intercepting missiles (military). A proper ROA also differs from EOA in that it requires detailed statistical data in order to proceed. Indeed, the analytic beauty and power of financial options analysis lies in the way it continuously adjusts the implicit discount rate it uses in its analysis to the risk content of the ongoing evolution of the system. This is remarkably clever and theoretically powerful. But it depends on correct descriptions of the uncertainties. In practice, ROA invokes substantial data on past events (such as the historic price of copper), processes this information statistically to define their distributions, then projects these patterns ahead to obtain the value of financial options on near term projects (such as the purchase of a copper mine). (See for example Tufano and Moel, 1997) EOA does not suffer from such constraints. The greatest limitation of ROA is its general inability to deal with path-dependent situations, and thus with multiple options simultaneously. ROA is an excellent mechanism for calculating the answer to straightforward yes–no questions, such as: is it desirable to acquire this option now or not? Should we pay more than some stated amount? Is it time to exercise or cash in on an option? However, ROA does not enable planners to explore the value of several options to use at any time (for example, by exercising desalination or recycling options to increase reliability of water supply). The technical explanation is that ROA assumes “path independence” for the value of options: the assumption is that the value of an option (for example, to buy oil at a given future price) is independent of the way the uncertainty (that is, the price of oil) evolves. While path independency is reasonable when individuals deal with large, liquid markets, the assumption is not realistic for managers of important engineering projects. This is because intelligent managers respond to what happens by adapting the system in some way, so that the eventual value of an option does depend on the evolutionary path of uncertainties. The practical consequence of this fact is that major standard analytic methods of financial options analysis (specifically, dynamic programming and lattice analysis) are not suitable for dealing with realistic managerial issues. EOA does not suffer from these limitations of ROA; EOA deals smoothly with path dependencies. Here again, this is a further instance in which EOA is better suited to addressing the issues associated with dealing with deep uncertainty. As a DMDU approach, EOA focuses on the investment, design, and management of technical systems. This is distinct from the majority of the other methods in this Part presented in this book, which can be used more broadly to develop adaptive strategies for both infrastructural and non-technical applications alike. For instance, a study of water security on the Colorado River (U.S. Bureau of Reclamation, 2012) used Robust Decision Making to explore both structural investments (such as construction of desalination plants) as well as non-structural courses of action (such as watershed management in the form of forest management). In contrast, an EOA of the same case study would focus in more detail on the technical aspects of the problem. This focus on technical systems somewhat narrows the scope of applicability of EOA as compared to the other DMDU approaches in this book. However, when considering different courses of action, the focus of EOA is on exploring the performance of diverse alternatives in more detail, each with varying degrees of flexibility in the form of options. Its more detailed analysis of different possible interventions provides unique insights, distinct from and complementary to those obtained from other approaches. For example, Dutch researchers have used the Dynamic Adaptive Policy Pathways (DAPP) approach to explore different possible policy responses to ensure continued flood protection and adequate fresh water supply in the Rhine Delta in the Netherlands (Haasnoot et al., 2013). They explored both structural alternatives, such as raising dikes and increasing pumping capacity, and non-structural measures, such as altered flow regimes or reducing the demand for water. Exploring these different types of measures using a DAPP approach provides insights about how long different measures stay effective under different future conditions, and demonstrates the impact of sequencing of different courses of action. In contrast, an EOA of the same problem could focus in more depth on the technical alternatives of dike raising and expanding pumping capacity, exploring how the performances of different structural designs compare. For instance, possible options could include reserving land adjacent to the dike or building it with a wider base, both of which support easy heightening of the dike later. When looking at the pumping capacity, options could include the addition of extra pump bays at the outset, enabling easy capacity expansion later on, or investing in pumps that remain functional over a wider range of water heads. The subsequent analysis would seek to compare how designs with and without an option compare, providing insights about the added value of incorporating flexibility in the form of options within structural design decisions. Ultimately, the EOA approach helps discover and indicate the options whose potential future benefits outweigh possible up-front added costs, if any. [Indeed, one of the benefits of options, and of flexible planning in general, is that they allow us to defer commitments until we need to do so, and thus in many cases to avoid their expense completely.] Similar to DAPP, EOA explicitly considers the timing of actions, and its analyses demonstrate those cases where we should take actions now versus waiting until later. its in-depth focus on technical systems, providing unique insights, distinct from and complementary to those obtained from other approaches. it actively expands the decision space of possible alternatives under examination. It explicitly seeks more flexible variants of previously conceived courses of action. Finally, EOA is a computational decision-support tool that relies on systematic analysis. In this sense it is clearly an “engineering” approach, insofar as it “runs the numbers” on the performance of an engineering system. (Among the methods presented in this book, Robust Decision Making (Chap. 2) and Decision Scaling (Chap. 12) can also be considered “engineering” approaches). It computes a distribution of possible outcomes for a desired set of measures of or assumptions about future conditions, and provides detailed results that document the advantages and disadvantages of alternative strategies or “game plans” for dealing with future uncertainties. (Exploratory Modeling can also be considered a computational decision-support tool, which is used in practically all of the DMDU approaches). The practice of EOA is still in its infancy. While it already has a substantial and expanding list of successful applications across many different fields, we still have a lot to learn about how to do it best and most efficiently. It is worthwhile to review two open questions. First, it seems clear to many of us that we should shape applications of EOA to the particularities of the substantive issues and needs of practitioners in specific fields. Different problems have different time scales and structures of costs, and different drivers of most effective design. For example, contrast the fields of water resources and real estate development. Water resources planning faces long-term, gradual, reasonably steady uncertainties (in the evolution of population, water usage, and climate), whereas real estate development must deal with cyclical trends punctuated by sudden market crashes. These two fields also differ in terms of their criteria of performance and their ability to deal with uncertainties. Whereas water resource planners greatly focus on reliability of supply, and have the general ability to ration use to some degree in case of need, real estate developers mostly focus on economic profit and principally concern themselves with the timing of market entry and exit. Thus, while EOA has already proven useful to both fields, analysts need to shape its detailed practice differently, according to the characteristics of each field. In terms of technique, a most pressing issue for EOA is that of defining a coherent catalog of computationally efficient screening models (also known as Fast Simple Models). The objective is to identify suitably simple yet representative models of complex systems. Researchers have already tried many possibilities with success in various applications. Practitioners have, for example, variously used functional forms they derived statistically from the outputs of a detailed model (called “meta-models”), used mass balance formulations to complex flows, and simplified complex models by dropping higher order terms or using partial linearization. No single approach will work everywhere, and it is sure that there will be limits to what we can do. That said, we can expect substantial progress in this facet of EOA (and DMDU in general). Our assessment is that the prospects for EOA are good. So far, applications have focused on “low-hanging fruit”—on opportunities to demonstrate analytically the potential value of adaptive strategies as compared to fixed strategies. Analysts are constantly uncovering new opportunities in new fields. Moreover, they are collectively documenting the need to change the paradigm of systems engineering and design from one of starting with fixed requirements, to one that recognizes that we need to acknowledge that conditions and opportunities change over time, and that good system design should be able to adapt to new circumstances, as they evolve or suddenly occur. Note ‘Threshold values’ in EOA serve a similar function to that of the ‘triggers’ or ‘adaptation tipping points’ used in other DMDU approaches. U.S. Bureau of Reclamation. (2012). Colorado river basin water supply and demand study: study report, Boulder City, Nevada [online]. Retrieved September 10, 2017 from https://www.usbr.gov/lc/region/programs/crbstudy.html.